The process of formation of Tajik nationality started as early as the 4th – 5th century and ended on the verge of the 9th – 10th centuries with the Samanids state. The ethnic groups of Tajiks were some of the ancient tribes of Central Asia: Bactrians, Sarmatian, Tokhars, Soghdians, Saks, and Massagets. 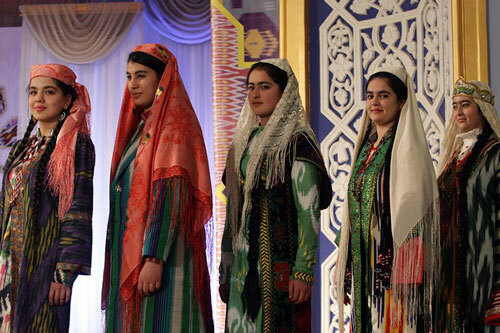 As all the Iranian-speaking people, and also Dards of India and people of Nuristan, Tajiks consider their ethnic origin as Arians. The direct predecessors of Tajiks were people speaking Eastern-Iranian languages. However the predecessors of modern Tajiks did not speak Persian — as they were related to the Western Iranian group of languages. The new Persian language, known as “farsi” in Iran and Dari language in Afghanistan is defined as “Tajik language” in Central Asia starting from the 8th century AD. The Eastern-Iranians adopted the Persian language in the period of the Muslim invasion of Central Asia by Arabs, which provoked migration of Persians (western Iranians) to Central Asia (including western China). As a result of this influence, local Eastern Iranians (Tajiks) started to speak Persian. But, undoubtedly backgrounds for their languages were the early Eastern Iranian languages and dialects. The majority of the Tajik population professes Islam. Most of the country’s population are Sunni-Muslims, and only a small proportion of Tajiks are Shia Muslims. One of the characteristics of Tajikistan is its high population growth with now about 9 million people living in the country.